You will find here useful information and tips to prepare your trek on the Lycian Way, either in full or in part. The months of April and May are the most pleasant and the most beautiful, but also the busiest. The mountainous section in complete autonomy (between Finike and Demre) passing by the stunning ruins of Belos and ending with those in Myra, including the church of St. Nicolas. Other interesting parts: the ruins of Kekova, the lighthouse at Cape Gelidonia, sleeping on the cliff of Kaş, Patara Beach and Butterfly Valley. 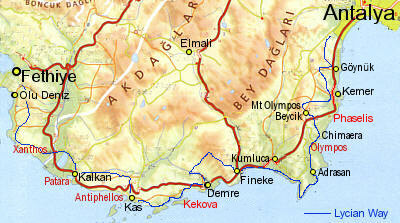 I recommend walking it in the expected direction (from Fethiye to Antalya). Not for the scenery, but to enjoy the book’s indications and painted markings. Still, it is possible to hike the route in both directions (I walked it in the opposite direction). One way or another, you might very well get lost. More than once. Carry a lot of water, know the name (and the pronunciation) of the village where you want to go and explore: the region is gorgeous! The terrain changes throughout the Way, with a mountainous section in the middle and one near Antalya. It takes time (2 days for each part, independently, with drinking water sources usually scarce). The hiking time on the trail is one thing, hiking time off the trail because you are lost is another. Trekking in the “wrong” direction without a compass or accurate map, I got lost every single day, between one and two hours a day. Sometimes more. Still, two short days (4 to 6 hours walking according to the book) may easily be merged into one. I took less than 7 hours to walk what was to be two days, adding up to 13/14 hours! If you choose camping, watch out for scorpions and “camel spiders” that come out at night and tend to like hiding in your boots. In the end, camping on the Lycian Way is definitely one of the highlights of my trip around the world… Give it a shot! Bonus tip: under the Roman bridge between Aşağıkuzdere and Gedelme (halfway between Çıralı and Göynük), a family runs a small restaurant/cafe/bar by the river. With the purchase of a meal (delicious), the owner will let you sleep in your sleeping bag on the platforms above the water. Unforgettable! Water sources on the maps can be dry, filled with waste, you might not find them, etc. Better to start with too much water and adjust yourself down the road, than the opposite. Especially in Turkey. A well, marked on my map as a water source. Turkish cuisine is absolutely delicious. While avoiding touristy and expensive places, try to eat in small restaurants or an inn from time to time. Food is a huge part of the Turkish culture you can’t ignore! The Lycian Way it is a fairly simple trek. It’s hot, it’s sunny and you will meet villages every day to wash your clothes. I used an average of 3 pieces of each garment (underwear, shorts and t-shirt). It’s only about how much weight you want to carry and how many times you are comfortable wearing each sweat drenched outfit. At least one walking stick is essential! You can easily find one on the way if you start with the mountains near Antalya, but bringing your own is always better. A hat, a scarf or a bandana for your head. Flip-flops to rest your feet at night and on the hidden beaches encountered along the way! Depending on the time of year, at least one set of pants and long-sleeved shirt for cool nights in your tent. Some wet or antibacterial wipes, to have some kind of hygiene in the tent. Especially if you hike through the heat in May/June. Bandages for blisters and medical tape to hold them in place. Water purification pills: save the environment (don’t buy plastic bottles) and yourself! Fortunately, you don’t need any permit to hike the Lycian Way. The only tolls you might encounters are for entering some of the historical sites, which are sometimes difficult to avoid, but not expensive and usually worth it. The transportation is also pretty easy to deal with: the Turkish minibuses (called dolmuş) run between every town and village, just like the normal (and comfortable) buses connect very efficiently every major city, like Fethiye and Antalya. You can expect to find dolmuş in almost any village, but don’t expect them follow any schedule as they usually leave when they’re full. If you find yourself stranded, lost on a road or in an emergency, hitchhiking is extremely easy in Turkey as the people are extremely welcoming and helpful, especially toward foreigners. Still, except for main cities like Istanbul and Ankara, women should keep in mind that a significant part of the population is still very conservative and religious. Therefore, hitchhiking is not recommanded for solo women who have never hitchhiked before. The book is mostly relevant to: the number of hiking hours estimated between villages (it’s rather conservative). The map included with the book is mostly relevant for: information about the villages you will meet (where can you find accommodation, food, transportation, etc.). The Wikitravel page is particularly relevant for: the distance between important locations (villages, ruins, etc. ), a larger amount of data and sometimes more accurate and practical info than the book. To get an idea of ​​the weather, go to wunderground.com, enter the name of the city (try with Antalya and Fethiye) and then choose to view the schedule for the desired period. To purchase detailed maps of the area and trails, it’s here. To download the free iPhone application from the map of the route (by Kate Clow) it’s here. Feel free to ask questions in the comments section!